Why Hire Our Atlantic City Criminal Defense Attorney? Why Hire the Law Offices of Robert L. Tarver, Jr.? Tough prosecution is found throughout the state of New Jersey. To resolve your complex legal case, you will need to obtain the help of a knowledgeable criminal defense lawyer in Toms River and Atlantic City. The Law Offices of Robert L. Tarver, Jr. can help you pursue the best possible result to your case because Robert L. Tarver, Jr. has the skills and resources necessary to build a solid defense. One of the qualities that you should look for in a criminal defense attorney is experience. Examine the background of the attorney to assess what he or she has to offer you. Robert L. Tarver, Jr. has nearly 30 years of experience helping clients obtain the results that they need. He has handled every type of criminal law case, from minor criminal charges to serious capital offenses. The Law Offices of Robert L. Tarver, Jr. also has extensive knowledge of how to assess and investigate cases. These skills can be used to develop a case that stands strong against prosecution's charges. Robert L. Tarver, Jr. uses his experience to help clients like you who need a source of hope during their darkest times. Look to his firm for the legal guidance you require after you have been arrested. At the Law Offices of Robert L. Tarver, Jr., Attorney Robert L. Tarver, Jr. is devoted to each client's case and is personally involved in his or her defense. Rather than just handing over my clients' cases to assistants like other firms, he provides one-on-one attention for the benefit each individual he represents. That way, he understands the client's needs and goals and can pursue them in court. During each case that he takes on, he uses my experience and resources to build a case on behalf of my client to present to the court. After determining the goal of each individual he represents, he takes every legal measure necessary to pursue the desired outcome. 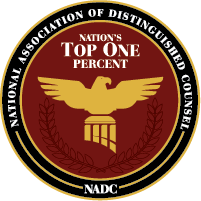 Throughout the country, he is recognized as a trial attorney because of his experience and success in court. If you are arrested for any type of criminal offense, Robert L. Tarver, Jr. encourages you to take immediate action and contact his firm. He offers free case evaluations to ensure that clients are fully taken care of throughout their cases. He is the Toms River and Atlantic City criminal defense lawyer that you will speak with when you need representation and he has a team of individuals who will also play various parts in the helping achieve your legal goals. Call today!